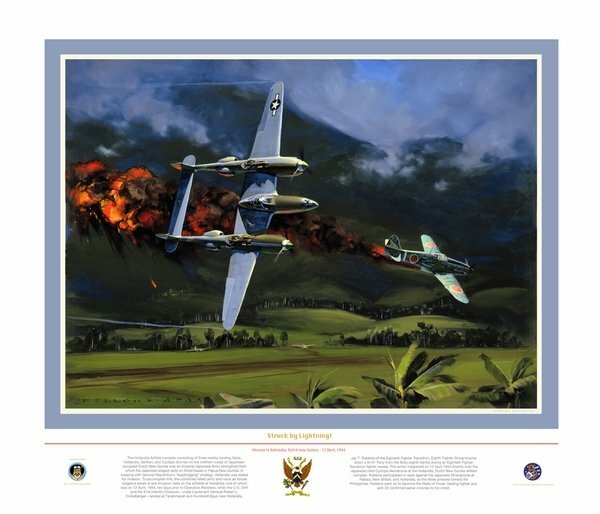 Paper Size: 28" x 23.5"
Jay T. Robbins of the Eighteenth Fighter Squadron knocks down a Ki-61 Tony from the Sixty-eighth Sentai during an Eightieth Fighter Squadron fighter sweep. The action happened on 12 April 1944 directly over the Japanese held Cyclops Aerodrome at the Hollandia, Dutch New Guinea, airfield complex. Robbins participated in raids against the Japanese Strongholds at Rabaul, New Britain, and Hollandia, as the Allies pressed toward the Philippines. Robbins went on to become Texas’ leading fighter ace, with 22 confirmed aerial victories to his credit.